Liver disease, often referred to as hepatic lipidosis or "fatty liver disease," in a beloved parakeet can cause serious symptoms that need to be examined by a vet immediately. Liver disease in birds is caused by fatty buildup in the liver, which can be due to obesity, excess hand-feeding, salmonella, contaminated water, viruses or E coli. In the following article, symptoms of liver disease in parakeets will be discussed. 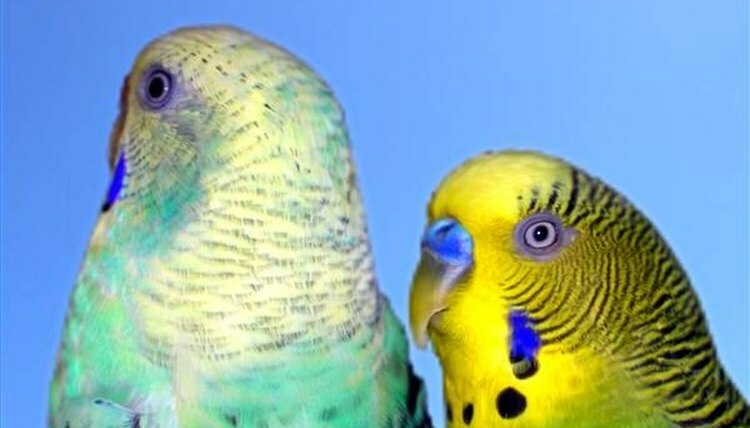 An indication that something may be wrong with your parakeet is the appearance of sudden difficulties with breathing. Oftentimes, when a bird has liver disease, it will open and close its mouth to breath, which looks somewhat like panting. Panting could also be caused by not enough water, over-exhilaration or excessive heat, so make sure your parakeet always has fresh water and isn't sitting in direct sunlight. Panting is an indication that the bird is uncomfortable, and it should be taken seriously if it persists. Parakeets suffering from liver disease will often have a greenish-colored diarrhea or urine, due to the excess of bilirubin in their system. In humans, excess bilirubin due to liver disease can lead to a condition known as jaundice, which is when the skin and whites of the eyes turn a yellowish color. Because birds lack the pigment that creates yellowish undertones of the skin, the excess bilirubin is excreted through defecation or urination. Another symptom of liver disease to look for in your parakeet is poor feather quality. Feathers will become brittle and break very easily. Liver disease in birds can also cause very dry skin, so there may be bald patches where your parakeet has bitten off of plucked his or her feathers. The feathers can also change color, an indication that something may be wrong. Overgrown beaks can be caused by inadequate self-grooming tools in your parakeet's cage, such as cuttlebone or mineral stones. However, fatty liver disease can also account for areas of softness around the beak, which don't allow proper wearing using self-grooming tools. The claws on the parakeet may be overgrown as well. There are a few other symptoms of fatty liver disease. Parakeets can experience loss of appetite, which in turn leads to weight loss and fatigue. Also, birds with liver disease are more prone to bruising, especially around their beaks and toes. Other symptoms include irritability, coordination problems, excessive water consumption, seizures and bleeding or clotting problems, which can lead to death.